Everything I have been doing for my reprint of the game Coup has been done after I stumbled across the rules online. After reading through them, I decided that I liked the game so much that I was going to add it to my collection. Finding that the only way to get this game was to do a reprint, I had to go in and edit the rules. Revamping the rules for Coup was a fairly simple process. Or at least it became fairly simple after I decided to not re-theme the game. Originally when I decided to go ahead with the reprint I wanted to give it a Space/Future theme. This eventually fizzled out for two reasons. The major one was that it was going to be more difficult to find "open source" artwork to use, and with commissioning artwork taking a lot of time, I decided I was too impatient. It can always be re-skinned after I cut my teeth on the production. The second reason is that I couldn't come up with Space/Future sounding names for the characters. Or at least ones that would make sense. Captain could stay the same and become a starship captain. Duke might become a Senator and Ambassador might become a Diplomat/Minister. But I didn't like any of these very much. And I had absolutely no idea what to do with the Contessa. Some of these names almost gave way to an American President theme (senator, first lady, president, vice president, assassin). But I found that theme a bit distasteful since it would boil down to political parties trying to kill each other. So in the end I decided to stick with the Italian Mafia style theme. So the rules themselves were pretty well written. Few exploits or loop holes were found. One concern was the lack of mention of how many actions you can take per turn. Also missing was a description of the turn taking itself. Along with that, continuity errors were cleaned up and consistency throughout the document was improved. To add a little bit of originality, I decided to change the name of a character in the game. I felt like "Ambassador" was a bit of a mouthful to say. I also felt like, based on my limited knowledge of 16th Century Italian culture, that it didn't fit the game as well. It took me a while to determine an alternate, but I eventually decided on "Governor". In the end, I really like Governor more than Ambassador. Initially, I wanted to change the "Contessa" to something else. But after some digging, I learned that "Contessa" fit the role to a peach. The definition being: an Italian Countess. Using that definition, I might change "Duke" to "Count", but I'll wait until I get my prototype set and get some comments from others. With all this in mind, I put together the rules. Adding a design, formatting, and etc, I have ended up with my prototype rules sheet. Unfortunately, I didn't read the information on the printing very well, and should not have put the background on the rules set, since the Documents from TheGameCrafter are not full bleed. I could have it printed as a one page "booklet" but I didn't feel like this little reprint should be anything fancy. I wanted to do a minibooklet, but again since this is just a fun little reprint, I didn't devote the time or effort into this. What I have been working on though have been three extra cards to include with the game. When the game is created, cards are printed in sets of 18. I pay for all 18 cards, even if I don't use them all. So with Coup only having 15 cards, I have 3 cards left for me to do whatever with. 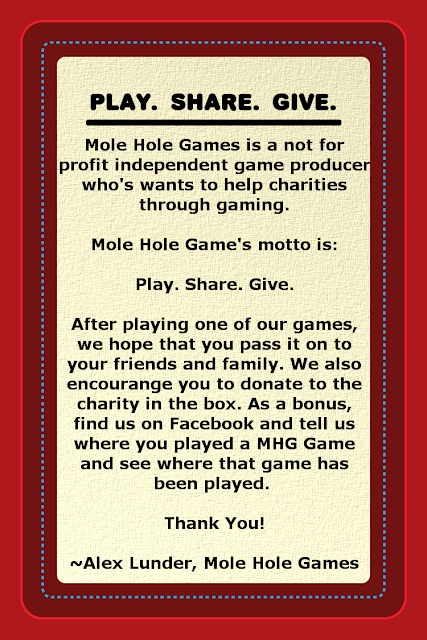 With one I have put my "game company". 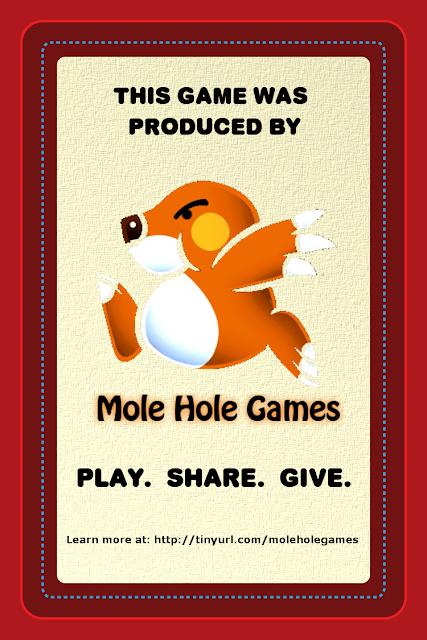 The second card will have a link to a facebook page. 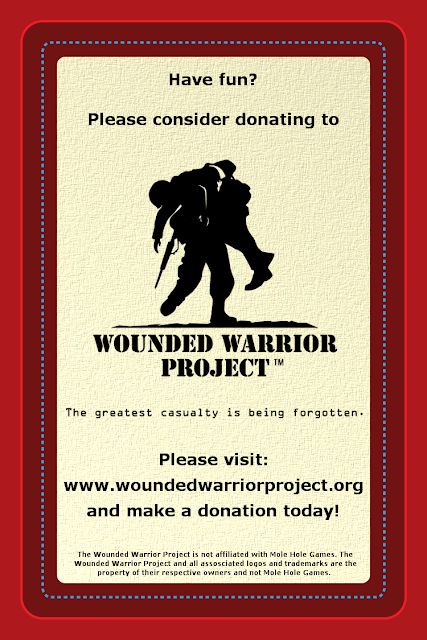 The third card will have a link to the Wounded Warrior Project for people do donate to. Concepts for these are included below. I noticed the error in card two.